Hiring Owner Operators and Company Drivers. Veterans, National Guard Reserve members and Professional drivers apply Drivers are our #1 Priority! Excellent home time to spend quality time with friends and family! Apply Today Local/Regional Work Regional - out 2 nights MAX Weekends OFF (Voluntary work available on weekends $) NO climbing on tanks Majority NO TOUCH Freight Owner Operators: $15K SIGN ON - 6 Months Tanker Experience $10K SIGN ON - No Tanker Experience SIGN ON PAID OUT in 12 MONTHS! 100% FUEL SURCHARGE Great pay averaging $2,500-5,000 Plates, Permits and Insurance Program No equipment needed! Driver Requirements: Must have at least 1 year of Tractor Trailer experience within the last 3 years Must have Hazmat, Tanker and TWIC endorsements Must not have any more than 7 jobs in the last 3 years Call or text Mike at 813-334-2598 or apply today Drivers are our #1 Priority! $15,000 Sign On Bonus! 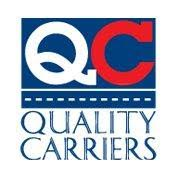 Quality Carriers-Now Hiring OTR Drivers! Being North America’s largest chemical bulk tanking company allows us to utilize resources other carriers can't to make you successful. Company Drivers are needed for the Jonesboro 168 terminal! Find Your Lane with Quality Carriers. QC Company Driver Benefits: $15,000 Sign on Bonus!! $3000 paid after First Load! Pays out in the First Year! $1200 Quarterly Retention Bonus Paid the First year! $.54+cpm (Practical Miles) $1200-$1500 average weekly pay (not including bonuses) Paid Orientation and On the Job Training! Referral Bonus- $4000 Per Driver NO LIMITS! Out 7-10 days, home 2. Terminal can accommodate home every other weekend. Epic Vue available in most trucks!! Industry competitive health insurance, 401K, PTO, THE WORKS Performance and Safety Bonuses Steady and consistent work Lease Purchase Available-Brand New 2019 Freightliner Cascadia REQUIREMENTS: Must have a CDL A License with Tanker and Hazmat endorsements Must have 1 year CDL A experience or 1 year of tanker experience Must have or be willing to obtain a TWIC Card Terminal 168-Jonesboro GA To Speak to a Recruiter Call or Text-Lindsey Conover 813-508-6491 If you believe you are a good fit to join our Quality Carriers family and work with North America's largest bulk tanking company and network. APPLY NOW to Quality Carriers for more of what makes a career with our company worth pursuing. Hazmat Tanker Driver Needed! Awesome pay and hometime! Are you a hazmat tanker driver looking for the adventure of the open road, but still want good home time and great pay? Then join the Quality Carriers affiliate, Coastal Flats Energy (CFE) in Jourdanton-763 ! OTR out 5-7 days, home 2 Weekly paychecks, $1100 to $2000 weekly average Regular full-time position Insurance after 60 days, (Health, Dental, Vision) Paid Orientation and On the Job Training! 401K with company match after 90 days Paid vacation, paid holidays Reliable Equipment REQUIREMENTS: Must have a CDL A License with Tanker and Hazmat endorsements Must have 1 year CDL A experience in the last 3 years or 1 year of tanker experience in the last 10 Must have or be willing to obtain a TWIC Card Satisfactory safety/driving record Terminal 763-Jourdanton Texas To Speak to a Recruiter Call or Text-Mike 813-334-2598 When you join the CFE team, you will enjoy the family like atmosphere of a small company while enjoying the stability and security of partnering with Quality Carriers, the largest bulk carrier in North America with out 100 years in the industry. You don't have to roam - call Boasso Home! Up to $15K Sign on! compensation: $4,500-$5,000 WEEKLY employment type: full-time Container Tanks - BOASSO GLOBAL Let us further your driving career! Seeking Owner Operators - apply today for consideration beginning in January! Owner Operators are paid line haul percentage, plus 100% of the present surcharge. Benefits with Boasso: * Excellent home time * Owner Operators can make up $200,000 gross annually * Drivers are expected to handle ALL areas of business to include Local, Regional and OTR * Freight is Monday through Friday. Weekend work is voluntary * All moves are round-trip Driver Requirements: - One year of tractor trailer experience within the last 3 years - Tanker, Hazmat Endorsements, including your TWIC Card - or willing to obtain your TWIC. - No more than 7 jobs within the last 3 years Call or Text Mike for more information (813) 334-2598 Drivers are our #1 Priority!! Boasso America Corporation, a premier inter-modal service company providing transportation and tank container services, is seeking skilled drivers to support operators at our terminal. BOASSO GLOBAL - Container Tanks - Looking for OTR Owner Operators! Hiring Veterans, National Guard, Reserve members and Professional Drivers **Up to $15,000 Sign On for Owner Operators** Pays out in 12 months!! No tanker experience required! Benefits with Boasso: * $10,000 Sign On for No Tanker Experience * $15,000 Sign On with 6 months Tanker Experience * Competitive Pay - $5,000 Weekly Average Gross * 3rd Party Insurance offered * 100% of the Fuel Surcharge goes straight to you! * We provide you an E-Z pass - you do not pay for tolls * OTR Runs Driver Requirements: - One year of Tractor Trailer experience within the last 3 years - Tanker & Hazmat Endorsements, TWIC Card - or must be willing to obtain your TWIC. - No more than 7 jobs within the last 3 years Call or Text Mike for more information (813) 334-3598 For immediate consideration, apply today. Terminal Location - Newark, NJ #567 Drivers are our #1 Priority!! Boasso America Corporation, a premier inter-modal service company providing transportation and tank container services, is seeking skilled drivers to support operators at our terminal. Quality Carriers and our affiliates are seeking MILITARY & VETERANS and professional truck drivers. We are looking for Company Drivers, Owner Operators. You've served the nation and can continue to serve in a role which is critical to our customers and the nation. Delivery of their products allows the country to grow and thrive. You can be a part of this by joining our team. Benefits Flexible Home Time Paid Holidays / Paid Vacation Dedicated Lanes Regional work Great Pay $$$$ Paid Weekly & Direct Deposit Available Paid orientation/training Plenty of ways to earn Extra $$$$$$ Sign on Bonuses available $2,000 or $5,000 Referral bonuses of $1,500 Steady year round work Medical, Dental, Vision Benefits / Premium 401(k) plan Requirements Must Have CDL-A with Tanker and Hazmat endorsements TWIC card (Must have or be willing to obtain it) Must have 1 year Tractor Trailer experience in the last 3 years Owner Operators- must be a Mid or Flat roof. NO CONDOS Questions call 888-690-9507 Quality Carriers will consider your Military experience: Apply Here ... for immediate consideration https://intelliapp2.driverapponline.com/c/qualitycarriers?r=driverspost As you can see we have many positions available posted on this site, with over 120 terminals we may have something in your area. If you are interested in one of them you need to apply by filling out the application. It is the only way we will know that you are interested and want us to contact you. We see a lot of views on the postings and some apply clicks but do not receive anything telling us you are interested in one of our positions. This link supplied takes you right to our application. We will contact you within minutes of receiving it and review the application with you and discuss the opportunities of the position that interest you. Thank you and have a great day. Quality Carriers for a Quality Career for professional drivers. Military friendly company. Immediate openings for CDL A with Tanker/Hazmat. Experience the family feel of a smaller terminal with the support of a big company. Quality Carriers is the nations largest bulk transportation company. With over 120 company and affiliate partners nationwide we have a career for you. The following locations have immediate positions available. Start you new career next Monday. No tanker experience needed. We are hiring in the following areas immediately. Due to expansion and growth we have an immediate need for Company Drivers. Company Driver Locations: Florence, VT; Albany, NY Waterford, NY Johnstown, NY Salisbury, NC; Sanford, NC; Augusta, GA Greenville and Richburg, SC; Lima, OH; Kent and Vancouver, WA; Calvert City, KY; Williamsport and Coraopolis, PA; Lansing, IL; Fayetteville, NC and Niagara Falls, NY. Benefits: Flexible Home Time Paid Holidays / Paid Vacation Dedicated Lanes Regional work Great Pay $$$$ Paid Weekly & Direct Deposit Available Paid orientation/training Plenty of ways to earn Extra $$$$$$ $$$ Sign on Bonuses available in areas Referral bonuses of $1,500 Steady year round work Apply Today Requirements : Must Have CDL-A with Tanker and Hazmat endorsements TWIC card (Must have or be willing to obtain it) Must have 1 year Tractor Trailer experience in the last 3 years Transitioning Military, currently serving National Guard or Reserve members we will consider your military driving experience with a signed Skills Test Waiver Application by the commander. Apply today and start Monday. Positions fill quickly don't wait. Make your next career your last one by joining our team. For immediate consideration apply below. https://intelliapp2.driverapponline.com/c/qualitycarriers?r=driverspost As you can see we have many positions available posted on this site, with over 120 terminals we may have something in your area. If you are interested in one of them you need to apply by filling out the application. It is the only way we will know that you are interested and want us to contact you. We see a lot of views on the postings and some apply clicks but do not receive anything telling us you are interested in one of our positions. This link supplied takes you right to our application. We will contact you within minutes of receiving it and review the application with you and discuss the opportunities of the position that interest you. Thank you and have a great day. Quality Carriers and our affiliates are seeking MILITARY -VETERANS and professional truck drivers. We are looking for Company Drivers. You've served the nation and can continue to serve in a role which is critical to our customers and the nation. Delivery of their products allows the country to grow and thrive. You can be a part of this by joining our team. Benefits Flexible Home Time Paid Holidays / Paid Vacation Dedicated Lanes Regional work Great Pay $$$$ Paid Weekly & Direct Deposit Available Paid orientation/training Plenty of ways to earn Extra $$$$$$ Referral bonuses of $1,500 Steady year round work Medical, Dental, Vision Benefits / Premium 401(k) plan Requirements Must Have CDL-A with Tanker and Hazmat endorsements TWIC card (Must have or be willing to obtain it) Must have 1 year Tractor Trailer experience in the last 3 years Questions call 888-690-9507 Quality Carriers will consider your Military experience: Apply Here ... for immediate consideration https://intelliapp2.driverapponline.com/c/qualitycarriers?r=driverspost As you can see we have many positions available posted on this site, with over 120 terminals we may have something in your area. If you are interested in one of them you need to apply by filling out the application. It is the only way we will know that you are interested and want us to contact you. We see a lot of views on the postings and some apply clicks but do not receive anything telling us you are interested in one of our positions. This link supplied takes you right to our application. We will contact you within minutes of receiving it and review the application with you and discuss the opportunities of the position that interest you. Thank you and have a great day. Veterans, National Guard, Reserve members and Professional Driver that are Owner Operators wanted BOASSO GLOBAL - Seeking Owner Operator Tank Drivers Excellent Home time to spend quality time with Family and Friends! Owner Operators: * $3,000 Average Weekly Gross * Overnight runs * Weekly runs - that get you home weekly! * Hours can be flexible * Voluntary Saturday shifts * Plates, permits, insurance - you can get them through us! * Steady work, year round! Full Time Position * 3rd Party Medical Benefits Available * Majority No Touch Freight! Driver Requirements: - One year of tractor trailer experience within the last 3 years - 1 year of recent tanker experience is strongly preferred - Tanker and Hazmat endorsements, including your TWIC - or must be willing to obtain TWIC - No more than 7 jobs within the last 3 years Call or Text Tracy for more information (813) 334-2598 For immediate consideration, apply today Terminal Location - Mobile, AL #521 Drivers are our #1 Priority!! Boasso America Corporation, a premier inter-modal service company providing transportation and tank container services, is seeking skilled drivers to support operators at our terminal. Hiring Veterans, National Guard, Reserve Members and Professional Drivers Excellent Home Time to spend quality time with friends and family!! ***Up to $20,000 SIGN ON BONUS for Owner Operators*** Call or Text Mike for more information - (813) 334-2598 * 1 year of Tanker experience within the last 3 years is Required Owner Operator Benefits with Boasso: * $1,500 Quarterly Performance Bonus after 1yr * $20,000 Sign On for 1 year of Tanker Experience * All out and back runs * Hours can be flexible * Voluntary Saturday shifts (Get extra hours for more money!) * Plates, Permits, Insurance Program within Boasso Global * Medical benefits available through a 3rd party Join our growing team and see what you've been missing! We have tons of freight, positive working atmosphere, and the best management in our market Steady work, year round! Full Time Position Driver Requirements: - One year of CDL A Tanker experience within the last 3 years - Tanker & Hazmat endorsements, including your TWIC - or must be willing to obtain your TWIC - No more than 7 jobs within the last 3 years Call or Text Mike for more information (813) 334-2598 For immediate consideration, apply today Terminal Location - Chicago, IL #584 Drivers are our #1 Priority!! Boasso America Corporation, a premier inter-modal service company providing transportation and tank container services, is seeking skilled drivers to support operators at our terminal.